A volcanic lava type inflammable liquid has been reportedly profiting out of the ground in Tripura's Jalifa village and has triggered panic among the local residents of the area. 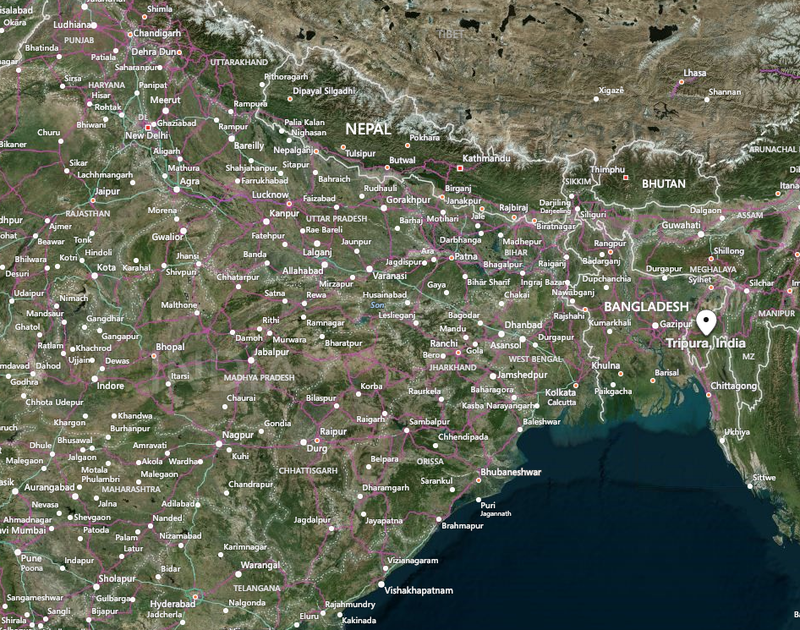 It has gradually become a matter of concern for the Tripura state government, in North East India, which is highly vulnerable to earthquakes as it lies in seismic zone V.
This is the third such incident reported this year the state which is very close to Chittagong in Bangladesh. In the recent incident that happened only a few days back, the local villagers of Jalifa were scared to find lava erupting from the lower portion of the electric pole on the roadside and reported the matter to the fire extinguishing team and local police. Meanwhile, scientists from the Department of Science, Technology and Environment of the Government of Tripura also visited the spot. After examining the spot and analysing the samples collected from the spot they concluded that the fire, smoke and other materials running out of the ground is due to a fault line that passes through that area beside the displacement of the underground tectonic plates in that region and which is creating huge subsurface heat causing the incident. However, Avisek Chaudhuri, from the Tripura Space Application Centre, who is the leading scientist team viewed that there is very little chance of eruption of lava or an active volcano. But the Science, Technology and Environment Minister of Tripura Sudip Roy Barman has expressed concern as the state has a history of recorded massive earthquakes earlier. Barman said that the government is taking the matter seriously. What is thought to be the largest known sinkhole in New Zealand ripped open across a farm on NZ's North Island earlier this year, revealing a gigantic cavernous void estimated to have been decades or even a century in the making. As of May 2018, the sinkhole, situated about 15 kilometres south-east of the city of Rotorua in a region called Earthquake Flat, measured as long as two football fields and plunges to a depth that would swallow a six-storey building. "The largest I've seen prior to this would be about a third of the size of this, so this is really big," volcanologist Brad Scott from Kiwi geoscience firm GNS Science told AP at the time. A farm assistant first came across the sinkhole in early May before the sun came up, narrowly avoiding riding into it on his motorbike when rounding up cows for milking early in the morning. Only later in the day, when visibility was improved, did the sheer scale of the gaping chasm become apparent. "It wasn't until I came down in daylight that I actually saw just how big it was," said farm manager Colin Tremain. According to Scott, the sinkhole could have been forming for up to 100 years, after decades of rainfall slowly eroded the farm's limestone rock foundations. After a period of intensive rainfall at the end of April that lasted for about a week, the last of the rock's resistance gave way, opening up to reveal this jagged, 200-metre-long (656 ft) ravine that looks like something out of the movie 2012. The 20-metre (66 ft) depth of the hole isn't just vertigo-inducing. It also offers a fascinating scientific cross-section to geologists, showing the gradual build-up and layering of rock, sediment, and soil over unimaginably long timescales. "What I see in the bottom of this hole is the original 60,000-year-old volcanic deposit that came out of this crater," Scott told TVNZ. "Then there's a stack of about 10 to 12 metres of sediment sitting on top of it from lakes that have formed in this crater. The top three metres is volcanic ash." What makes this sinkhole so much bigger than ones that have preceded it in New Zealand is the record-breaking rainfall that helped cause it – almost 170mm of rain in 38 hours. Thanks to that decisive deluge, volcanologists and landslide scientists will be busy over the next few weeks, inspecting the chasm, and seeing what they can learn from it. Others meanwhile, are just happy this giant void didn't swallow them whole – like the farm assistant, Gabriel Lafalla, who narrowly avoided riding into the sinkhole in the pre-dawn darkness. "I could have died," he told Stuff. "I touched myself [the sign of the cross] and said to myself, 'I'm alive'." Fissures that formed near fields are also affecting crops, as they drain water meant to irrigate the thirsty land. Tehran isn't the only sinking city. Satellite observations have also shown that Venice, Italy; parts of western Texas and coastal Louisiana; California's San Joaquin Valley and San Francisco International Airport are victims of subsidence. Should the sinking continue, Tehran's railways, bridges, gas and oil pipelines, and electrical infrastructure could be at risk, the journal Nature reported. The seismic waves began roughly 15 miles off the shores of Mayotte, a French island sandwiched between Africa and the northern tip of Madagascar. The waves buzzed across Africa, ringing sensors in Zambia, Kenya, and Ethiopia. They traversed vast oceans, humming across Chile. India: Land cracks in Samastipur district of Bihar. Five children were killed while six children were injured due to soil erosion in Samastipur district of Bihar. According to the information, about 18 boys were brought to the soil for the Chhath festival and they were buried under the soil. The incident took place in Najirpur Surhania Pokhar of Ujaipur of Samastipur district. Costa Rica: Land cracks in San Vito. Thirteen families of Barrio Los Granados in Santa Clara de San Vito, Coto Brus, had to be evicted from their homes by cracks caused by a landslide that puts them at risk. Forty people inhabit this area that has been exposed to constant rains in the last days that caused the landslide of 17 hectares of land, generating cracks of up to 25 centimeters and ruptures of land of one kilometer in the sector of Santa Clara. Those affected had to take their belongings to move to live in family homes or in rented homes. The eviction was made emergency because the land is very unstable and could give way at any time. Fortunately the people of this area followed the indications of the CNE without putting resistance. "Possibly all the houses are going to be completely deformed, the road will be destroyed and in the future all these houses will have to be relocated," the expert added. The Local Emergency Committee made available a shelter in the community hall of Santa Rita de Limoncito, at the moment there are no people occupying it, but it is ready to be used if necessary. Indonesia: 75 meter landslide road, 10 isolated Nagari in West Sumatra. Padang - The Government of Sijunjung District, West Sumatra, has set a two-week emergency flood and landslide response period. There were a number of other landslides that occurred in the area. In Sijunjung, floods and landslides caused one person to be killed and hundreds of houses submerged and cut off the road, the only residents living in 10 villages because they collapsed for 75 meters. "We have set. Emergency response period for 14 days," said Regent Sijunjung Yuswir Arifin told AFP on Monday (5/11/2018) afternoon. He added that the emergency response period will be implemented until November 18. Specifically for the collapsed road, Yuswir said, it was certainly difficult to repair it because the road had collapsed and the river was washed away. "The only way, we need to make a new road. The road now cannot be used anymore. Repairing the collapsed road requires more costs and takes longer because the land condition is still potentially landslide," he said. A small part of Japan may have been wiped off the map as officials fear an island off the country's northern coast has been washed away. 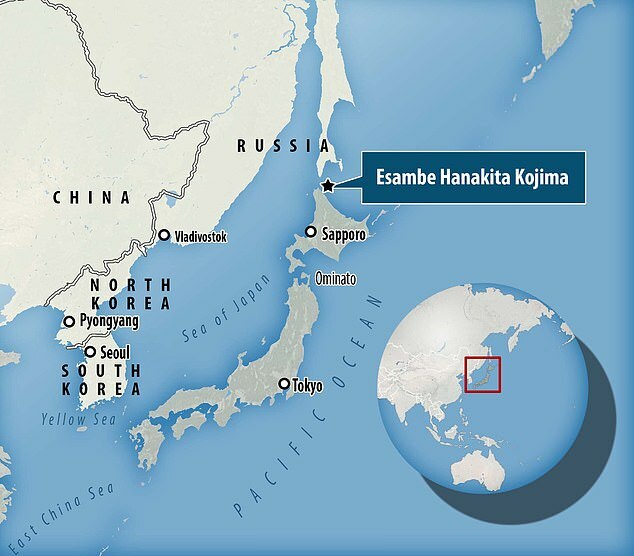 The island of Esambe Hanakita Kojima was only officially surveyed and registered by Japan's coastguard in 1987, who could not even say exactly how big it was. 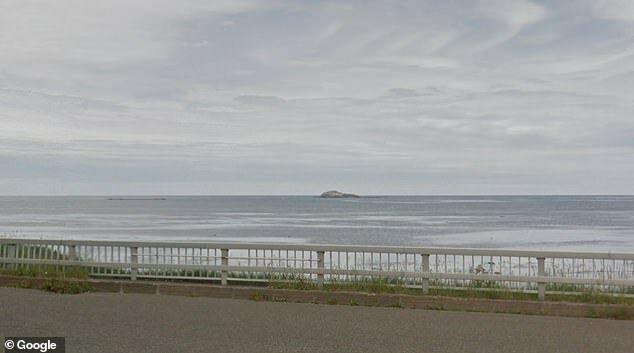 Until recently it rose less than five feet (140cm) above sea level, and was visible from the very northern tip of Japan's northern Hokkaido island. But authorities now fear the Japanese island has gone, ever-so-slightly shrinking the country's territorial waters. 'It is not impossible that tiny islands get weathered by the elements,' a coastguard official told AFP. The disappearance of the island 'may affect Japan's territorial waters a tiny bit,' she added, but only 'if you conduct precision surveys'. Coastal dwellers in the village of Sarufutsu reported last month they could no longer see the island, according to Japanese broadcaster NHK World. 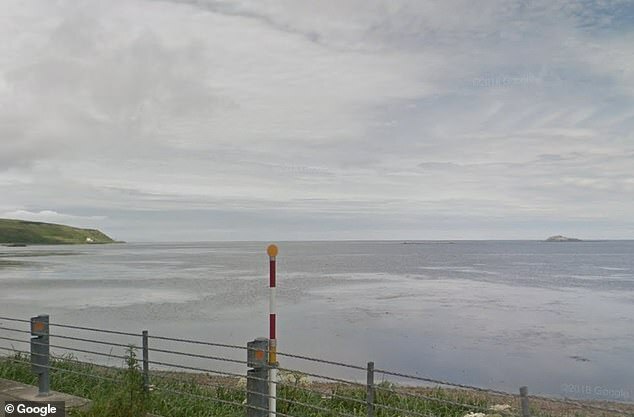 A fishing group sent out a team of boats to check on the island but they reportedly could not find it. Japan pours resources into protecting its outer islands, particularly the remote Okinotori islands in the Pacific, which secures a significant portion of the nation's exclusive economic zone. It is also locked in disputes with neighbours, including China and South Korea, over the sovereignty of several islands in the region. And in 2013, a volcanic island appeared around 1,000 kilometres (620 miles) south of Tokyo, engulfing an existing island and continuing to grow. Malaysia: Huge crack appears in orang asli village. IPOH: Kampung Pawong in the Pos Slim Orang Asli settlement in Simpang Pulai south of here has been declared unsafe for occupation after a huge crack appeared in the ground. The 50m-long, 1.2m wide and 1.5m deep crack, which appeared at about 3pm yesterday, has affected three houses badly, Perak Minerals and Geoscience Department director Datuk Ahmad Zukni Ahmad Khalil said. “Right now, the area is unsafe. Heavy rain and its proximity to the river bank are the primary factors,” he said in a statement. A row of six houses built in 2008 at the settlement had to be evacuated yesterday following the appearance of the crack. Ahmad Zukni said the crack was just 10m from the river and at a height of 60m, and there is a possibility of erosion taking place due to heavy rain. “This causes cracks along the alignment of the river,” he said, adding the crack has appeared on reclaimed land. Kampung Pawong, located 14km from Simpang Pulai, has 15 houses and a surau. Meanwhile three flood evacuation centres were opened yesterday, one each in the Kampar, Hilir Perak and Larut Matang, with the rising water level at the main rivers in the district following continuous rain since Tuesday. A statement issued by the State Disaster Management Secretariat stated that as noon, 165 people from 55 families have been evacuated to the three relief centres. In Larut Matang Selama, 64 people (26 families) from three villages – Kampung Temerlok, Kampung Tengah and Kampung Tebok – were evacuated to the relief centre at Sekolah Kebangsaan (SK) Temerlok, Trong.